Now people all over the world can be annoyed by the Motorola Q, with the Moto Q q9 officially rolling out in Barcelona with the ability to handle that quick like a bunny HSDPA connectivity. There's also a Moto Q GSM model debuting, so now you can connect up all over the world on the Q with quad-band GPRS and Edge capability. Plus, both of the these latest Q family members have the latest Microsoft Windows Mobile 6 software on board. 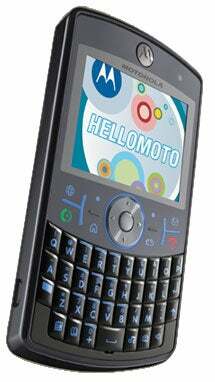 If you're familiar with the first generation Motorola Q, you might notice the styling updates in these new models, too, where no longer do you see that big honking Jay Leno chin on the thing, and the keys look like they're little easier to navigate as well. And of course, there's that obvious difference, where this one is available in that oh so cool black color. If only Motorola had released this design initially, perhaps we'd be a bit more fond of our Motorola Q.